We have 3 cities in our region in the top 20! Sadly, that’s not a good thing as the top 20 we’re referring to is the house break-in hotspots for 2014. Moneysupermarket looked at the number of claims per 1000 home insurance quotes provided through their website for 2014 to create the list. Perhaps unsurprisingly, Greater London features most prominently with its regions occupying 13 of the 20 spots on the table including the top position for Dagenham (RM8 postcode). Yorkshire-wise, Doncaster’s DN2 postcode fares the worst at position 4 with 48.3 claims/1000 quotes (up from 28.7/1000 the previous year). Bradford didn’t feature at all in the previous year but has the dubious pleasure of appearing in the list twice for 2014 with postcode BD2 at number 8 (49.9/1000) and BD18 (43.9/1000) at number 11. Leeds is also in twice with LS28 (42.2/1000) at no. 15 and LS15 (40.8/1000) just making it in at number 20. Worryingly, the rates are increasing nationally as a whole. In 2014 Dagenham achieved the top position with 55 claims/1000. In 2013 it was Manchester with 45.2/1000 and in 2012 Leeds topped the table with just 34.8/1000. That’s an increase of 60% in just 2 years. The area that came last in 2014’s table with 40.8/1000 would have been at number 5 in the previous year. It’s not all bad news though; the YO16 area of East Yorkshire made it to number 13 on the table of the places least likely to experience a break-in with just 1.66/1000. … of course that’s not exactly a practical answer so if you do live in one of those postcode areas (or even if you don’t) the only line of defence you have is to do what you can to protect your home from burglars. 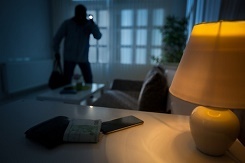 We’ve shared a number of tips on preventing a break-in previously on the blog (here’s the most recent post) and these are all good things to try and stick to but by far the most effective deterrent you can use is a functioning, properly installed burglar alarm. Any would-be intruder checking out these contained areas (and they tend to be affluent areas where the potential haul is greatest) will naturally choose properties that present the lowest risk and greatest ease. They are much more likely to have a go at a house that does not have an alarm than one that does. It’s that simple. If you don’t have an alarm, or you do have one that isn’t working as it should, then please get in touch to see how we can help you. Don’t wait until you become one of the statistics. Call 0800 612 9799 (from a landline) or 0345 833 5543 (from a mobile).